The sun’s rays filter through the leaves of the hombre grande trees and cast a silhouette over the Farallón rock face,a wall of 925 square-feet where the Corobici indigenous people recorded dozens of petroglyphs (images made through incisions on rock face) to recall their relationship with nature and daily life. On the banks of the Cabuyo river, in the village of Cedros, in the central district of Cañas, even the wind seems to whisper songs of the rituals that these indian people sang to Sua (the sun god) and Chía (the moon god). They immortalized these deities on the face of El Farallón. The Corobici lived in what is today territory of the Cañas canton: The Tilaran mountain range, the eastern zone of the Orosí volcano and the southern part of Lake Nicaragua from the early years of the Christian era until 800 AD, anthropologist María Fernanda Rojas says in her guide Getting to Know our Corobicí Heritage. The Farallón monument was declared a Costa Rican national historic heritage and architectural site in 1998, and it is the largest, private archeological site in the country, according to Rojas. 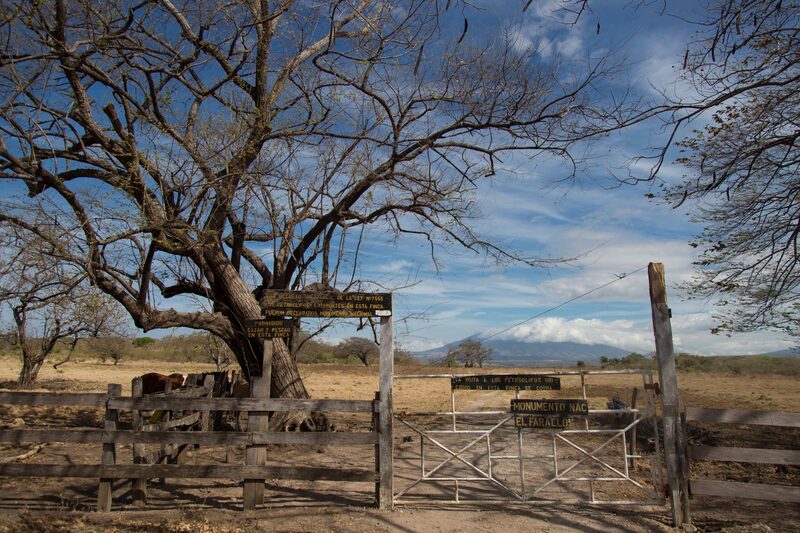 This is what the entrance to Finca Las Lomas, in the Cedros community in Cañas, looks like. A large part of the road is gravel so it’s recommendable to use a double traction vehicle. It’s located 14 kilometers (9 miles) from the center of Cañas, on the Las Lomas farm, which belongs to the López Monge family. (See address in Waze). The López Monge siblings —Elías, Juan, Mariano and his wife Giselle Elizondo— are the guardians of this archaeological gem, which was the site of religious ceremonies and natural life cycles of the Corobici people. The Lopez family lives on ranch stuck in time. They still conserve the corral, cows, horses and traditional corredor with wooden rocking chairs, ideal for meeting over coffee and doughnuts during the warm April afternoons. It is here where we start our trip to the Farallón. Juan López is our guide. Armed with a small machete and his canvas sombrero, he takes us through the 2,000-foot long Sendero del Sol trail (sun trail), named by the López family for the figure of the star, which is the Farallón’s most recognized petroglyph. In fact, two years ago the family decided to register the image with the National Registry in order to use it on shirts and hats. “The sun is representative in the cosmos of the stars and the Corobici culture. It’s one of the central petroglyphs,” explained national heritage center archaeologist Elena Troyo Vargas. After cutting jocote fruits from a tree along the trail, we reach the depths of the dry forest and find ourselves among olive, balsa, wild cashew and cocobolo trees. We descend down a set of natural stairs made of dirt and roots and the Cabuyo River greets us with its pools. To our right, we see the impressive rock face of El Farallón. This is the Cabuyo river, located in front of El Farallon. Tourists can jump in with prior authorization from the Lopez family. “People who live here have to be people who like nature, observation and meditation,” Juan López says as he tells me in a quiet voice that we must remain silent and look carefully at the rock face in order to find the images. 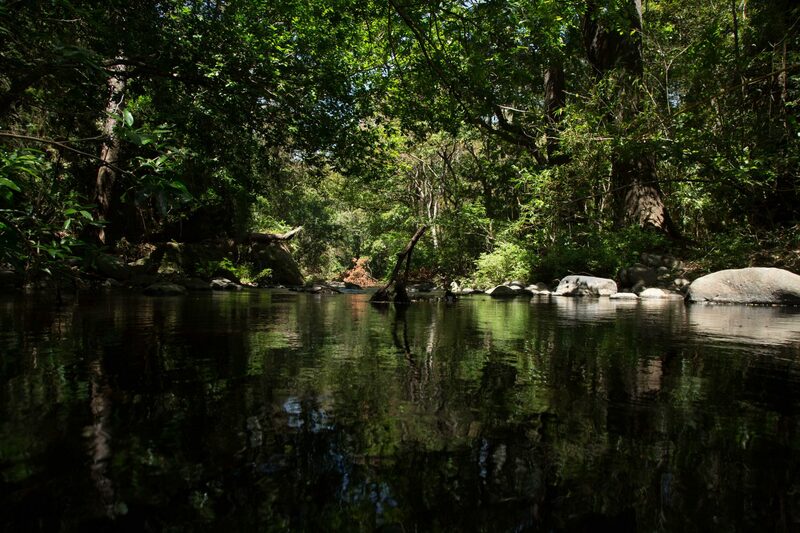 As the minutes go by, El Farallón starts to reveal its hidden treasures to us. The drawing of the sun is the first one we are able to see, and then human faces start to appear, then a jaguar, a fish and even a lizard. 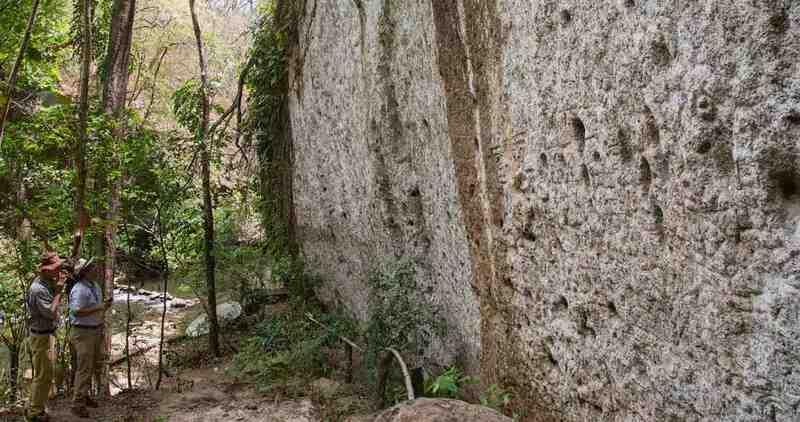 It is believed that the Corobici people chose the Farallón to make their petroglyphs because it is a rock face of large dimensions, located alongside a tributary. Also, because the ignimbrite rock, which is of volcanic origins, lends itself to the creation of drawings on its surface since its texture is malleable, according to Troyo, the national heritage archaeologist. 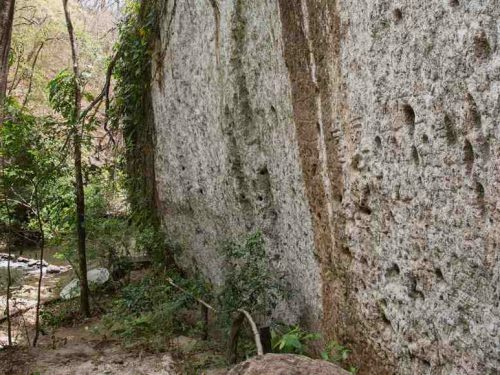 “El Farallon is, in Guanacaste, the archaeological monument that has the greatest quantity and variety of petroglyphs in a single rock,” the archaeologist said. The Corobici people used a technique called fluting, which consists of making grooves in the rock with sharp tools also made of rock. Fear of heights wasn’t a problem for these ingenuitive artists. It is believed that they used a wood scaffold system fixed to the rock to stand on while they created the images, anthropologist Maria Fernanda Rojas explains in her book. While still in awe of the great ingenuity of the Corobici people, we realized it was noon and hunger was setting in, so we decided to return to the López ranch where Giselle Elizondo received us with rice, snails and tuna, smoked cheese curds with tortillas and pineapple juice. As we enjoy the food and the stories that this simple and hard-working family shares with us, I think about the invaluable treasure that they protect and its potential of being developed into a model for rural, community tourism. But the Lopezes aren’t thinking about large investments, and only change ¢3,000 ($5.30) to enter their property. They recommend that visitors call them beforehand at (+506) 2200-0073 in order to host them properly. “Because of the access road (gravel road), it’s not just any tourist that comes. We are here to take care of and respect them.” This is how they decided to care for the legacy that the Corobici people left them.